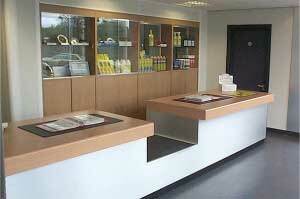 A bright, well-lit, warm and inviting retail area is of great importance to any business. Clean lines, an uncluttered appearance and good signage in the shop combined with well laid out window displays is the key to getting customers to come inside. The ideal layout of shelving depends largely on the size of the retail premises in question and the type of product you sell. Generally, the layout should incorporate full height shelving around the walls, to provide maximum use of space, with lower-level shelving to the middle of the shop. This allows customers to look past the aisle they are in to find the items that may interest them. In addition, wide aisles allow people to stop and browse without blocking the gangways and feeling that they are in the way. Glass fronted serving counters provide additional storage and display areas as well as cash desks and it is important to make it clear where they are located within the store. Good lighting, clean lines and a high ceiling make premises seem larger than they actually are. This sets the scene for display areas and a suspended ceiling helps to conceal all the electrical and mechanical services, while ensuring no unsightly wires are on display to distract the eye. Demountable partitioning systems are not only the quickest, cleanest and easiest to install they are a very cost-effective whole life option and ensure any future refits or modifications can be carried out with minimum disruption of trading areas.